Continuing our wandering among the exhibits at The Mariners’ Museum in Newport News, Virginia, we ran across this photographic reproduction of a 1702 etching of Howland Great Dock near Deptford, England, where ships were built, repaired, and moored. 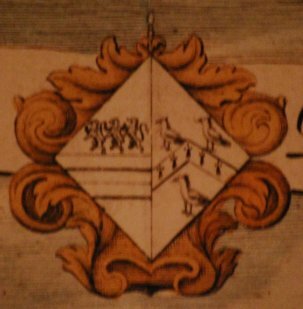 At the top center, in pride of place, was a coat of arms that could be blazoned, On a lozenge, Two bars and in chief three lions rampant, impaling A chevron ermine between three [birds] close. A quick search in Papworth’s Ordinary of British Armorials gave, unsurprisingly considering the subject of the etching, Howland (Cambridge; London; and Streatham, Surrey; granted 1584): Argent two bars in chief three lions rampant sable. Wyke: Argent a chevron ermine between three plovers proper. Jervis (Petling, co. Leicester): Sable a chevron ermine between three hawks close argent. I suspect that Wyke is a little more likely than Jervis; no doubt a little genealogical research would let us pin this down more strictly, but that’s a lot of work for a few moments’ curiosity. 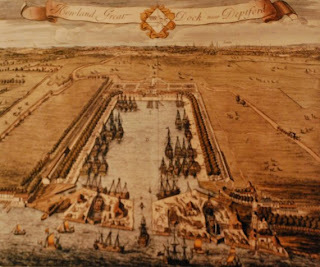 A general search on the internet found an entry for Howland Great Dock and noted that the dock was built on land leased from and with monies provided by Elizabeth Howland. (Greenland Dock was built on the site in the 19th Century, and survives to this day.) I suspect that, since the Dock was named after her father, while the shield (a lozenge) is hers, the arms are those of her father impaled with those of her mother. Elizabeth Howland's grandfather was Sir Josiah Child: http://en.wikipedia.org/wiki/Josiah_Child. Per the article, his arms were "Gules, a chevron ermine between 3 eagles close argent." Looks like the arms you showed! Ah, ha! That would be it! Thank you so much.